Matt Crafton, driver of the No. 88 Great Lakes/Menards Toyota Tundra, made his 15th career NASCAR Camping World Truck Series (NCWTS) start at Michigan International Speedway (MIS) in Saturday afternoon’s Careers for Veterans 200. Showing speed in both practice sessions, the ThorSport Racing driver qualified on the outside pole for the 100-lap event, led the field four times for 23 laps, and finished seventh. The top-10 result was the ThorSport Racing driver’s fifth top-10 finish at the 2-mile speedway, and his 10th top-10 in 14 starts this season. Starting second, Crafton took the lead at lap one, and led the field for 12 of the first 20 laps of the 100 lap event. Complaining of a Toyota Tundra that was, “free on entry, and snug off,” the two-time Champion fell to fourth by the first caution at lap 32. Crew chief Carl “Junior” Joiner brought the No. 88 machine to pit road three times during the 100-lap event at lap 32, for four tires, and fuel, under the second caution at lap 46, for fuel only, and under the fourth caution, at lap 64, for four tires, and fuel. Restarting inside the top-15 with just over 30 laps remaining, the Menards drivers utilized the draft and avoided three major accidents with the leaders, to finish seventh behind race winner, Brett Moffitt. The NASCAR Camping World Truck Series (NCWTS) had two practice sessions on Saturday in preparation for Saturday’s Careers for Veterans 200 at MIS. Matt Crafton was second, and sixth, respectively, in both sessions. Making his 15th career start at MIS, Crafton qualified second, led the field four times for 23 laps, and finished seventh in the rain delayed event. In 15 starts at MIS, Crafton has led 24 laps en route to two top-five, and five top-10 finishes. In 14 starts in 2016, Crafton has one pole (Atlanta), two wins, and has led 417 laps en route to four top-five, and 10 top-10 finishes. In 375 career NCWTS starts, Crafton has led 2106 laps en route to 12 poles, 13 wins, 93 top-five and 220 top-10 finishes. 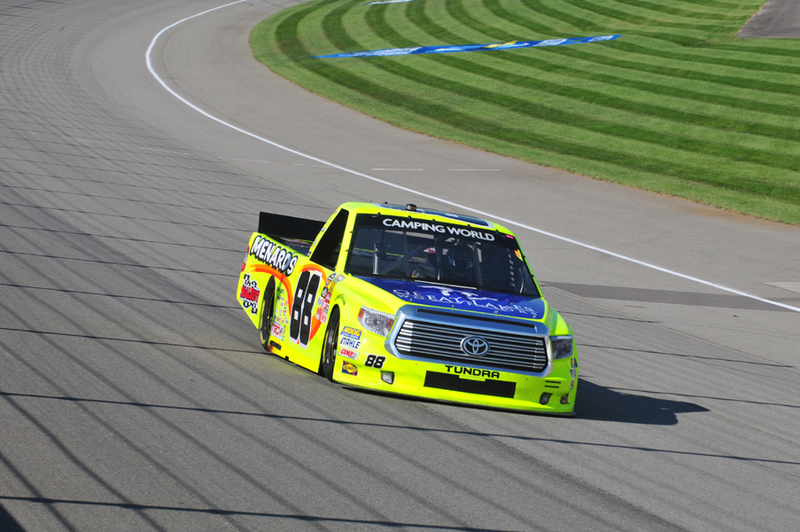 Crafton’s ThorSport Racing teammates finished fifth (Hayley), sixth (Rhodes), and 13th (Abreu).